Page added in December 2017. Photos taken in September 2017. You may wish to read a page on Mount Vesuvius in Goethe's Footsteps first. This is Vesuvius, lately green with umbrageous vines; here the noble grape had pressed the dripping coolers. These are the heights which Bacchus loved more than the hills of Nysa; on this mountain the satyrs recently danced. This was the abode of Venus (a reference to Pompeii), more grateful to her than Lacedaemon; this was the place renowned by the divinity of Hercules (a reference to Herculaneum). All now lies buried in flames and sad ashes. Even the gods would have wished not to have had the power to cause such a catastrophe. Martial, Epigrams. Book 4 - Mainly based on Bohn's Classical Library (1897). One hates writing descriptions that are to be found in every book of travels; but we have seen something to-day that I am sure you never read of, and perhaps never heard of. Have you ever heard of a subterraneous town? a whole Roman town, with all its edifices, remaining under ground? Don't fancy the inhabitants buried it there to save it from the Goths: they were buried with it themselves; which is a caution we are not told that they ever took. You remember in Titus's time there were several cities destroyed by an eruption of Vesuvius, attended with an earthquake. Well, this was one of them, not very considerable, and then called Herculaneum. Above it has since been built Portici, about three miles from Naples, where the King has a villa. This under-ground city is perhaps one of the noblest curiosities that ever has been discovered. It was found out by chance, about a year and half ago. They began digging, they found statues; they dug, further, they found more. Since that they have made a very considerable progress, and find continually. The precise situation of this subterraneous city was not known till the year 1713, when it was accidentally discovered by some labourers, who, in digging a well, struck upon a statue on the benches of the theatre. (..) Little progress was made in the excavations till Charles, infant of Spain, ascended the Neapolitan throne; by his unwearied efforts and liberality a very considerable part of Herculaneum has been explored, and such treasures of antiquity drawn out as form the most curious museum in the world. It being too arduous a task to attempt removing the covering, the king contented himself with cutting galleries to the principal buildings, and causing the extent of one or two of them to be cleared. 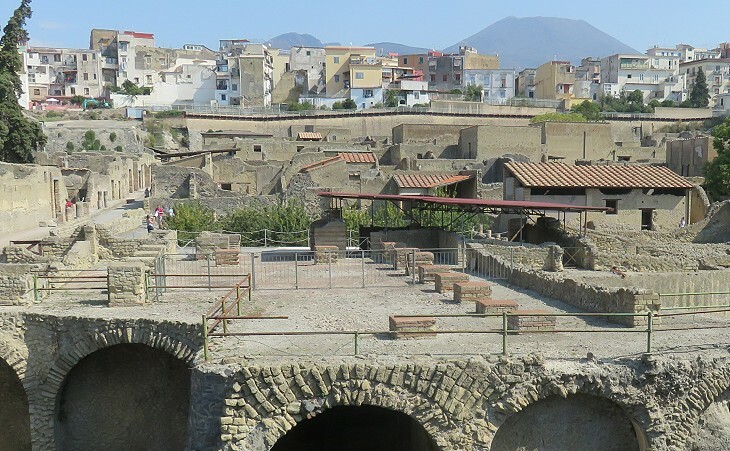 After the interesting spectacle afforded at Pompeii, our subterraneous researches into its neighbouring fellow sufferer Herculaneum will in a great measure lose their interest but that interest will be speedily recovered on a view of the Royal Museum at Portici. (..) Here the eye will long dwell with rapture and amazement on the varied mass of articles restored to light by the industry of man, but at the same time it will regret that more industry has not been employed in the protection of such valuable researches. 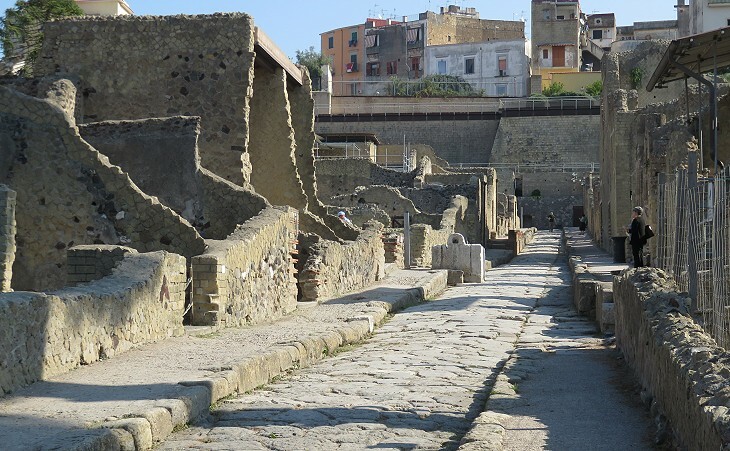 We must not any longer put off our visit to Herculaneum, and the Museum of Portici, where the curiosities which have been dug out of it are collected and preserved. That ancient city, lying at the foot of Vesuvius, was entirely covered with lava in 79 AD, which subsequent eruptions successively raised so high, that the buildings are at present sixty feet below the surface. It is a great pity that the excavation was not executed systematically by German miners; for it is admitted that the work, which was carried on at random, and with the hope of plunder, has spoilt many a noble monument of ancient art. 1827 plan of Herculaneum published by Andrea De Jorio in "Notizie su gli scavi di Ercolano"
Digging began in 1738, and it continued using the technique of underground passages and ventilation shafts until 1828, when the first open-air excavations were carried out. The plan by De Jorio is therefore based only on the results of the underground excavations. These were chiefly aimed at finding statues, jewels and other antiquities which could embellish the nearby Royal Palace of Portici. Searches were particularly successful at three locations: the basilica in the centre of the town, the theatre and Villa dei Papiri, a country house by the sea where many scrolls were found. In 1816 the works of art found at Herculaneum were moved to Museo Borbonico, today's Archaeological Museum of Naples. Presently going down, with lighted torches, we are perplexed by great walls of monstrous thickness. It is almost impossible to realise that the ruins which we now see in their black gulf can have been once beneath the blue sky, "before," as Tacitus says, "the burning mountain of Vesuvius changed the face of the country". 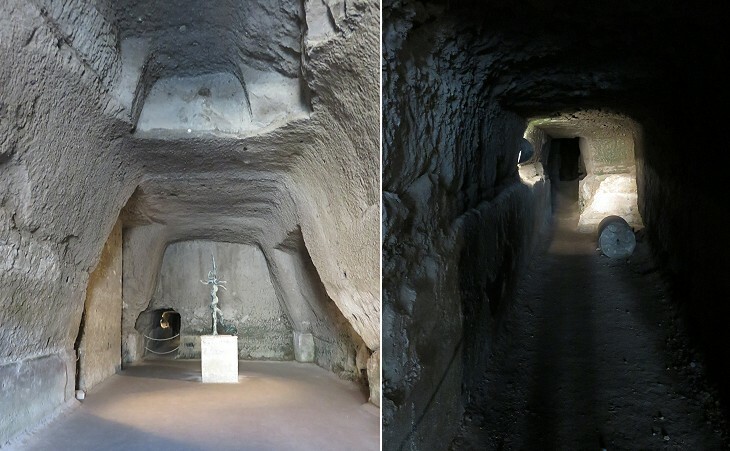 Some of the underground passages, and in particular those leading to Villa dei Papiri, had to be closed because of exhalations of volcanic vapours. In 1927-61, after a very long interruption, systematic excavations unearthed approximately a quarter of the ancient town. 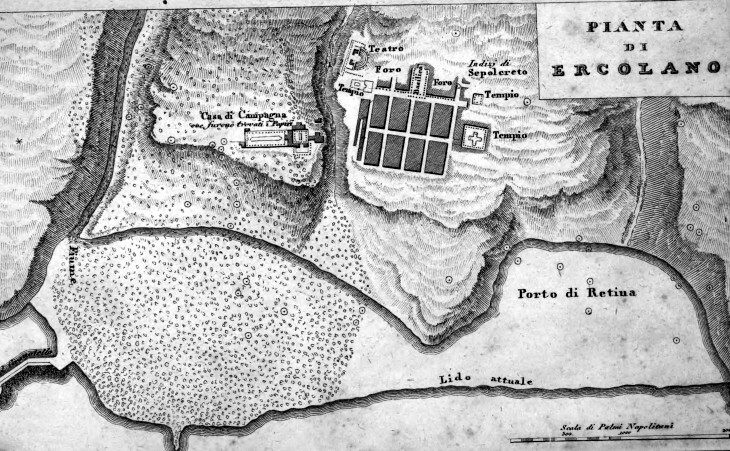 More recent archaeological activity led to the conclusion that the ancient coastline was closer to Herculaneum than it was shown in the 1827 plan. 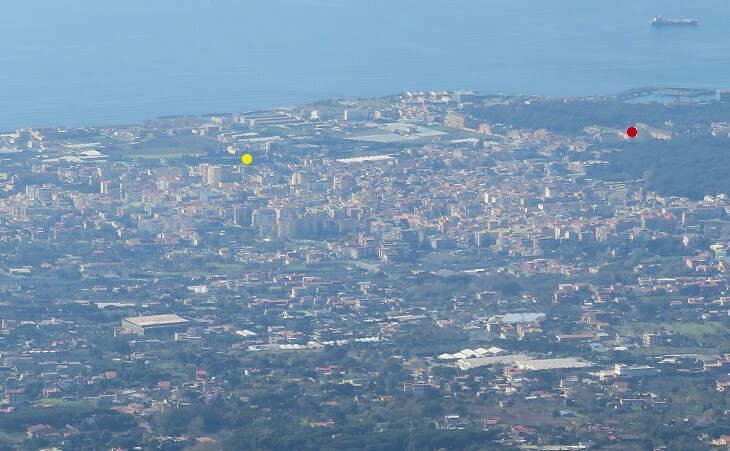 In 1969 Resina, the town which was founded in the Xth century above the ancient one changed its name into Ercolano. 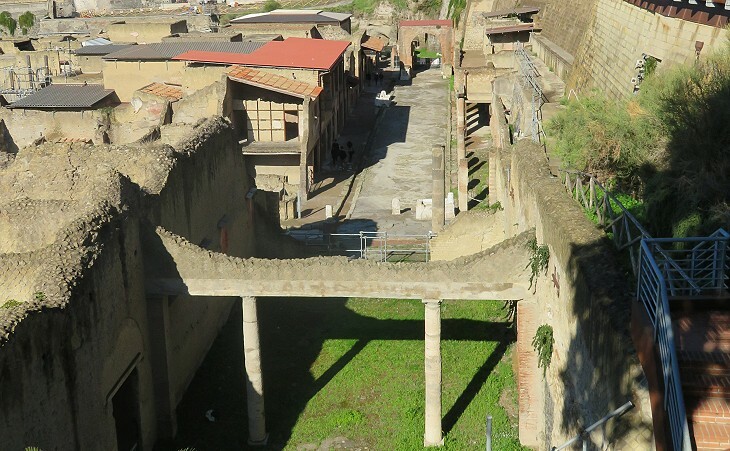 The theatre and the north-western section of Herculaneum lie beneath its houses. 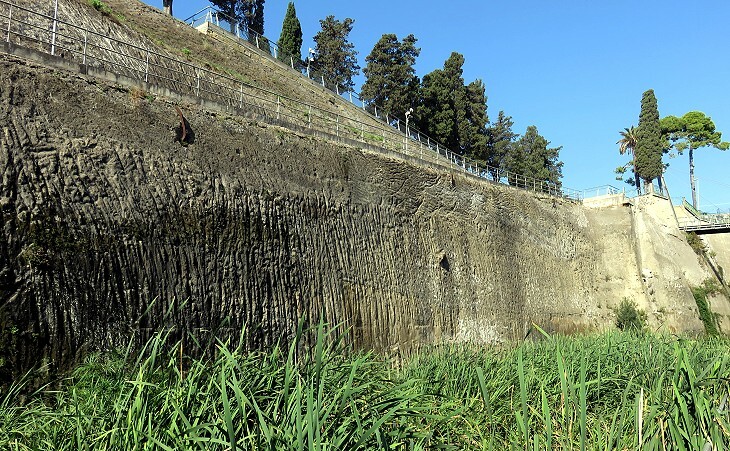 Herculaneum was covered by flows of volcanic rock which solidified to an average height of approximately 16 m/ 50 ft. Its aspect is not similar to that of the lava which covered parts of Catania after the 1669 eruption of Mount Etna. 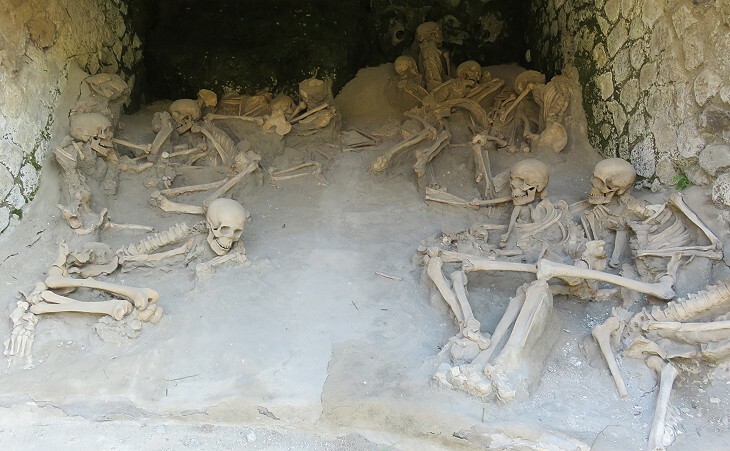 In 1980 approximately 300 human skeletons were found in shelters for boats along the beach; here, along with any valuables they were able to recover, especially necklaces and coins, the people of Herculaneum had sought escape. They were killed by the high temperatures caused by the blazing clouds exploding from the volcano. 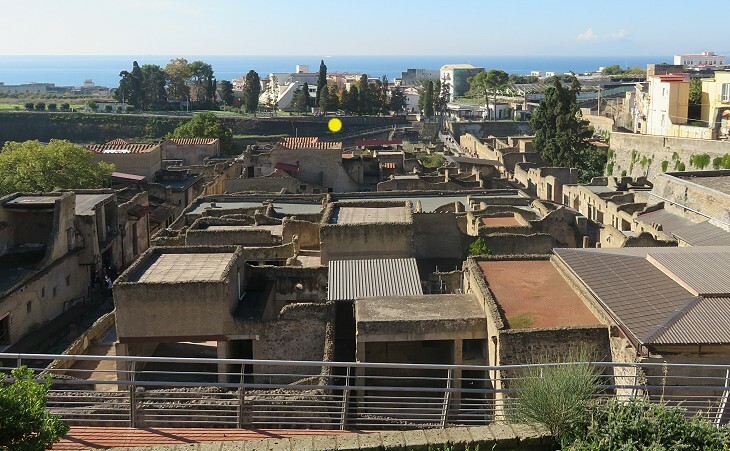 According to tradition Herculaneum was founded by Hercules on his way back to Greece from Spain. The town was much smaller than Pompeii and it was most likely redesigned at the time of Emperor Augustus. 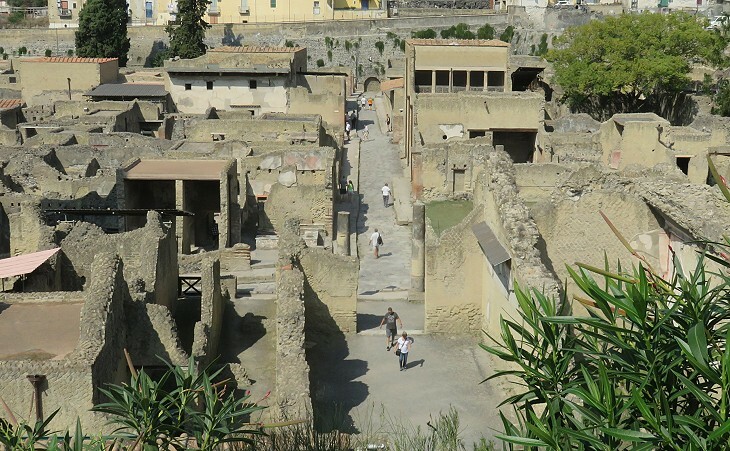 Although its population is estimated in just 5,000, yet Herculaneum had all the facilities of a wealthy Roman town: a forum, a basilica/tribunal, a theatre, an aqueduct, a system of public fountains, baths and a city layout divided into regular blocks. The town had at least three decumani. Only two of them have been fully identified, but nearly half of their western section is still underground. Herculaneum was affected by a major earthquake in 62 AD and some of its buildings were restored at the initiative of Emperor Vespasian. The eruption of Mount Vesuvius occurred shortly after the Emperor's death in 79 AD. According to the account by Pliny the Younger, as reported by medieval manuscripts, it occurred on August 24, but today most archaeologists agree that it occurred in October, because of fruit, food and coins which were found at Herculaneum and Pompei. The decumani were intersected by five perpendicular streets (cardi) of which the two western ones lie under the modern town as well as the northern sections of the other three. 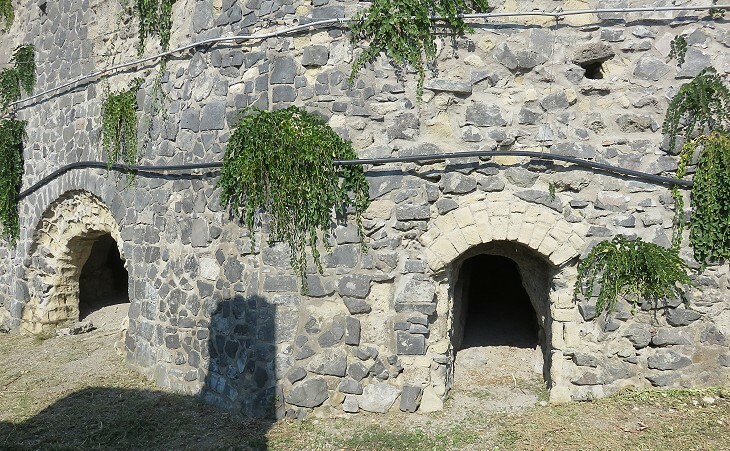 The archaeological area open to the public does not include the theatre, the basilica and Villa dei Papiri, nor access to the underground passages. The town stood on an elevation between two small streams which provided natural harbours. The material erupting from Mount Vesuvius added a strip of land to the sea side which is approximately 400 m wide. Imposing structures on the beach, most likely shelters for boats, supported a terrace outside the city walls where the citizens of Herculaneum erected a funerary monument to M. Nonius Balbus, a great benefactor. The image used as background for this page shows the old ticket office of the archaeological area. 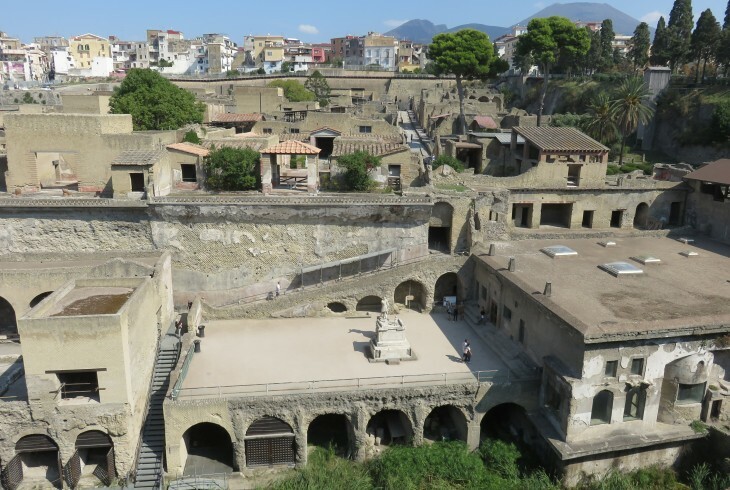 Herculaneum - Shops, Baths, Fountains, etc.